A new gold ring, this is a commission just completed, and shows how earrings, for example, can be re-used, and by being reworked can give jewellery a new life in a form more likely to be worn. This is a one off original by Helen Burrell. 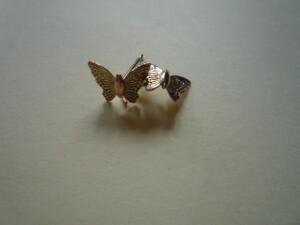 My client asked me to create a ring for her using these butterfly earrings you can see below as decoration. I designed a garden theme first depicting ivy leaves and berries. and then placed the butterflies on the leaves as though they were basking in the sun. Many thanks to my client for the opportunity to design this piece and I hope she has great enjoyment in wearing it. If you like the idea of reviving jewellery into a new form you can have your jewellery reworked too . Please feel free to contact me to discuss your requirements. Butterfly earrings brought to me by my client, to be redesigned into details on a new ring. 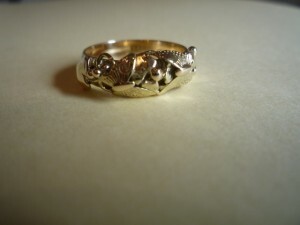 This entry was posted in Commissions, Enhanced Jewellery, News, Portfolio, Rings. Bookmark the permalink.